The interview with Faye Yip was led by Nils Klug in the context of a Workshop on Ba duan jin given by Faye in the Tai Chi Studio, Hannover, in Summer 2016. 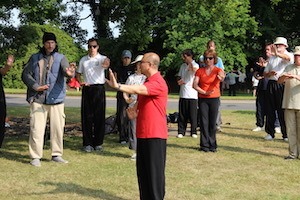 I believe – because yesterday we talked about how to encourage people to do Tai Chi and Qigong and also to encourage younger people – there is one… let’s say “challenge”, not “problem”: you really have to practice and you have to practice long time. We talked about our beginning and we used to train quite a lot and hard and it’s very hard to find students nowadays – I can really only talk about Taijiquan – to practice hard, on a regular base and so on and so on. Do you have the same experience? Yes. Yes, I think it is becoming a little different now. We have seen different students coming through the doorway – we touched upon this a little bit – this is alike to the social changes. 20/30 years ago a big part of the followers of Tai Chi were coming from a martial arts background. To them, it is kind of a softer martial art. So they are already in their mindset of wanting to see how it works, the martial application, the push hands, the techniques and what works/what doesn’t work. – So in a way people were more dedicated to practice, because they wanted to see how it works. It was more like a game, there was a little more attraction – you could see the immediate effects – whether it worked or not. With forms, that immediate feedback is not apparent. With your forms, there must be another way to stimulate the learning and to give feedbacks, whether they are doing right. With push hands, with the martial aspects, you can work in pairs fairly easily and you can get into the drill, but it means a different approach. Nowadays, we see different people coming through the door that are a lot less martially aware. They are only coming to Tai Chi and Qigong for health reasons and they are stressed out perhaps, suffering from chronic problems and less mobile. Many of them have not done any regular exercise for years and they probably just come and expect Tai Chi to fix all of their problems very quickly. We are seeing a shift of different kinds of students and that’s where the challenge is. And hence a little bit less: (1) going through the forms can be a bit boring and to their eyes – they have to remember it and they are not really used to remembering the sequences and (2) there is no immediate feedback, like a little buzz, to see whether you are locked up or whether you can move – it is not immediately there. And we have a practical challenge: from their point of view in theory they all know: “I should, I should…” – but in reality it is like you have to see the carrot; in their frame of mind: “Where is the carrot to make that effort to practice?” – So it is a challenge nowadays.